There are 10 upgrade levels determining the cost of each level, the slot count, and the number of items that can be stored in each slot. ocd:? Provides you with useful information regarding Orbital Cargo Drone. 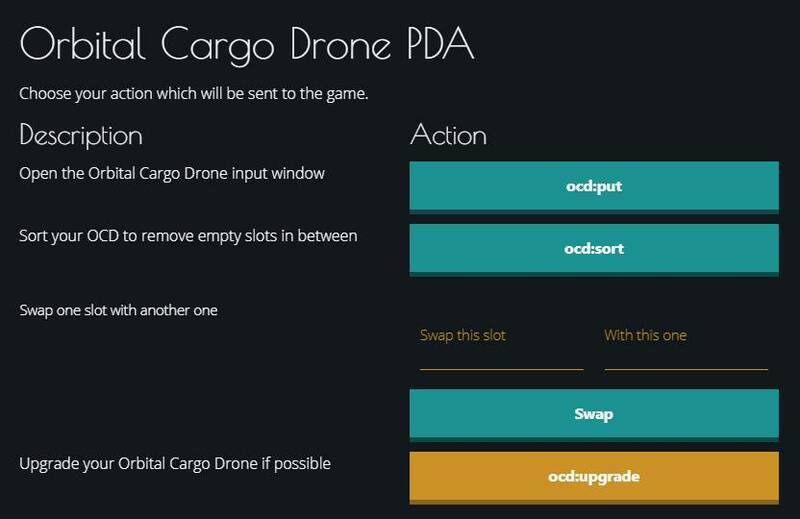 ocd:info Shows you the current level and slot count of your Orbital Cargo Drone. ocd:upgrade Allows you to purchase and upgrade OCD. To upgrade a current OCD, simply type the buy command for it again and make sure you have enough credits in your bank account to buy it. ocd:get:SLOT*AMOUNT Gets a certain amount of that item from the OCD slot. ocd:get:SLOT Gets all items from that OCD slot. ocd:get:all Gets all items from the OCD if possible. ocd:trash:SLOT*AMOUNT Trash a certain amount of that item from the OCD slot. ocd:trash:SLOT Trash all items from that OCD slot. ocd:put Opens a window to interact and put your items to the OCD. ocd:put:HAND-SLOT Puts all items from your Hand-Slot (1-9) into a free OCD slot. Example: ocd:put:1 for the first slot of your hand. ocd:put:all Puts all items from your Backpack into free OCD slots. Make sure to wait at least 30 seconds after you placed items into your hand slots! ocd:sort In case you have some unused slots you can clear the empty space between these slots with this command. ocd:swap:ID-from:ID-to Swaps two slots in your OCD with the given IDs. Patrons have more OCD features and commands! NEW: Only possible to use OCD in the OCD Zone! Possible to use OCD from any PvE Zone (Prototype Planet & Orbit excluded)! Note: OCD Zones are available at multiple locations. Example: If there are 999 Fusion Cells your hand-slot 1 and 500 Fusion Cells in your hand-slot 2 you can type ocd:put:1, wait 10 seconds, and then type ocd:put:2. Within a minute or so, you can check online on HWS Connect to confirm that you now have 1499 Fusion Cells in OCD Slot 1 - if it was empty when you entered the command. The items are then available for withdrawal when the player chooses to GET them. Note: At the owner/admin’s discretion, some items may be removed or reduced between seasonal wipes in the interest of balancing gameplay or for other reasons. 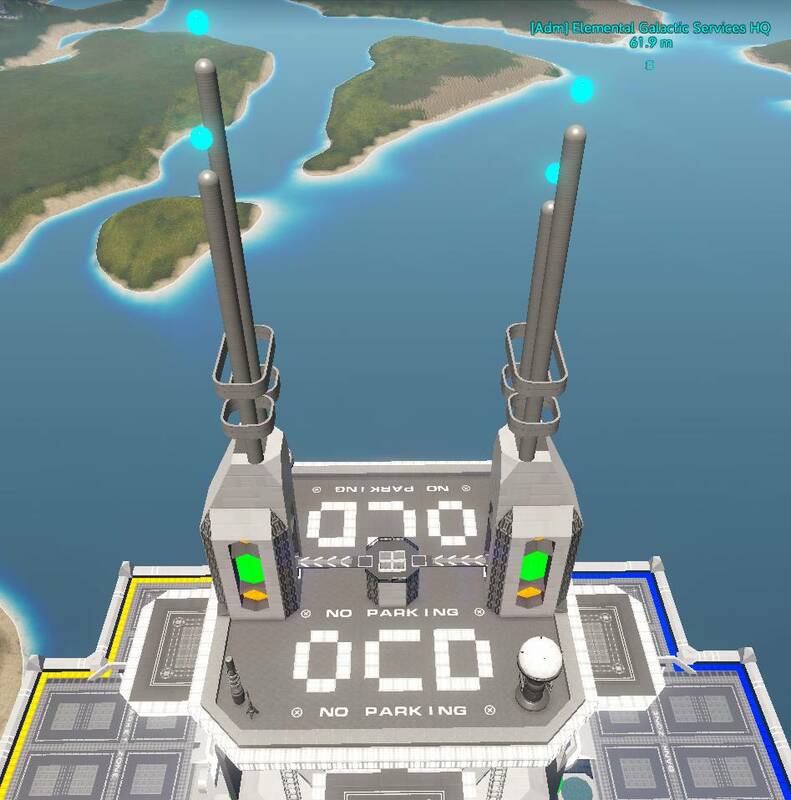 Upcoming wipe: players and OCD?